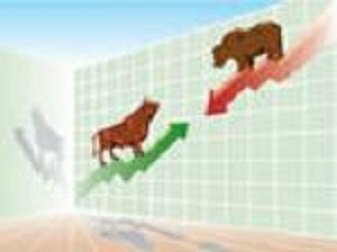 Trend Trading - Learn Trend Following Stock Market Trends with the Experts! Trend Trading, is probably one of the easiest techniques for the new trader or investor to understand in the stock market. In reality, it's actually Trend Following. The advantage of trend following is simple...you never miss a major stock market trends move. If the stock you are watching turns from a down to an up direction, your trend following indicator must flash a "buy" signal. If it is a strong major move, you will get the signal. Trend-trading is a is based upon capturing gains by a stocks momentum in a particular direction. The trend-trader enters into a long position when a stock is trending upward, or a short position is taken when the stock is in a down trend. Stock traders who employ a trend following strategy do not aim to forecast or predict specific price levels; they simply jump on the trend (when they perceived that a trend has established with their own peculiar reasons or rules) and ride it. Trend-trading can be used by short-, intermediate- or long-term traders. The idea is to find a great up trending stock, buy it and ride it until the trend changes. Trend-trading is based around the human element - this is the core to succeed in trend trading. It takes discipline and emotional control to stick with trend trading through inevitable market ups and downs. Trend traders seek to capture the majority of a market trend, up or down, for profit. First of all, you must confirm that a trend is indeed in place. Read the section on trendlines to learn on how to establish and confirm a trend. 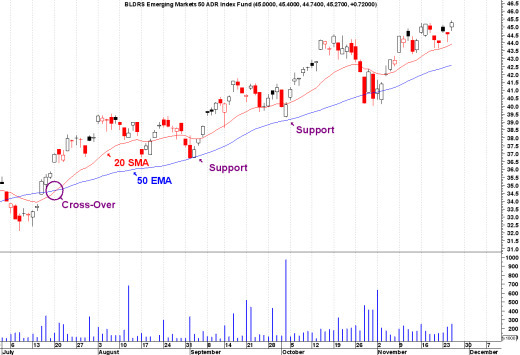 An example of trend-trading is shown in the chart below, using using an indicator such as the 50 Day Moving Average Indicator is also beneficial when trading a trend. As long as the 50 day avg is trending up, and the stock either stays above it, or touches it and bounces off it, the trend trader remains in his position and continues to ride the trend. If the stock breaks bellow the moving average on high volume, the trader sells his stock. The astute trend following trader must know that if he/she can get on-board a major move, the profits from just one trade can be very lucrative. In fact, one trade could make your whole year. Once in the trend, the trader sits back and enjoys the ride, as long as the stock market trend keeps going in the stock traders direction. This is commonly known as "letting your profits run". Eventually, the trend ends at some point. As a result, when the trend direction changes, the trend-trader ”cuts his losses short”, he sell immediately. Risk management receives top priority - Trend traders always have defined exit protocols to control management of trades executed. Stop losses and proper leverage usage are standard practice. If you have the laid back personality, then trend-trading may be a fit for you! Huh...you mean they're raising turtles to trade stocks now? Well, it is the new Millennium you know!! What started as a bet about whether great traders were born or made, became a legendary trading experiment. Of the thousands of people who who applied, 23 turtles were accepted. Their trading made $100 million for Dennis, leading some to become highly successful traders in their own right. One of the original Turtle Trader's, Curtis Faith, spells out the Turtle stock trading system in detail. His book Way Of The Turtle: The Secret Methods That Turned Ordinary People Into Legendary Traders, provides a template for trend-trading, or trend following. Most helpful is the way he breaks down the method into different components. I don't think it's necessary that one be a dedicated trend trader, or rather a trend follower to greatly benefit from this book. Besides being a fun and interesting read, it is an excellent introduction to the various components of trading methods and how they impact outcomes. It is also a first-rate integration of the psychology and techniques of trading. Perhaps most important of all, Way Of The Turtle is an illuminating presentation of risk management and consistency, two major contributors to stock market success. Return from "Trend Trading" to "Stock Trading Systems"
Return from "Trend-Trading" to the Home Page: "Stock Market For Beginners"